Starting in Eugene we will drive to Crater Lake National Park for the day, then drive to Bend and spend the night. The next morning we will visit the High Desert Museum, the beautiful town of Sisters, Sahalie Falls, Goodpasture Covered Bridge, and end in Eugene. We will leave Eugene at 8:00 am and as we drive to Crater Lake we will stop at Salt Creek Falls which is Oregon’s second highest single drop waterfall, cascading 286 feet. This waterfall is also one of Southern Oregon’s most powerful falls, with an average yearly flow of 50,000 gallons per minute surging over the rocks. 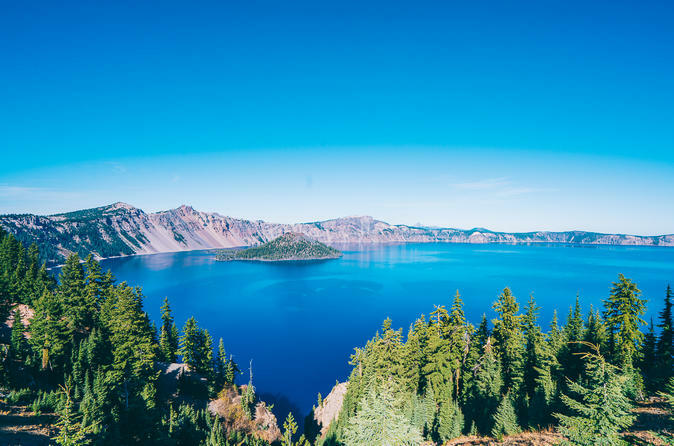 Upon arrival at Crater Lake we will spend the day visiting all the incredible vistas, visitor centers, and overlooks. Crater Lake has inspired people for thousands of years with some of the 1st Native Americans who discovered its beauty and mystique. No place else on earth combines a deep, pure lake, so blue in color; steep surrounding cliffs almost two thousand feet high; two unique picturesque islands; and a violent volcanic past. It is a place of immeasurable beauty and the Nations deepest lake over 1,900 feet deep. Tonight we will spend the night in Bend, Oregon. You will have free time to explore downtown Bend and visit craft breweries. The next morning we will visit the High Desert Museum. This unique museum reveals the natural world and cultural history of the West’s High Desert region through artful exhibits, alluring animals, engaging programs and meaningful history. The Museum feels like stepping into a different time and place. Get close-up views of native wildlife such as river otters, bobcat, and birds of prey. See art through a different lens. Chat with historic characters who’ll share tales of early Oregon explorers and settlers. Visit an authentic homestead and sawmill from 1904 and learn about Native American culture and history. Next, we will drive to the town of Sisters, where you will have free time to explore the quaint downtown and have lunch at one of the amazing restaurants. Sisters is a charming town with an 1880’s western theme and the shops in this town are anything but old-fashioned. Well-known artists work graces downtown Sisters in a variety of galleries and shops. Our next stop of the day will be at Sahalie Falls. Sahalie (or “Heaven” in the Chinook language) is a mass of foaming white water plunging 100 feet over a natural lava dam. Take an easy walk through forests of 6-foot-thick Douglas fir and droopy-limbed red cedar to see this beautiful waterfall. This famous falls can be spotted in Disney’s movie Homeward Bound. As we continue our drive to Eugene we will drive over the historic Goodpasture Covered Bridge and you will have the opportunity to photograph it! This quintessential covered bridge is Oregon’s most frequently photographed covered bridge – and it’s easy to see why. Excellent vantage points along Hwy 126 showcase the bridge’s elegant 165 foot (50 m) span across the scenic McKenzie River. The bridge itself is well crafted with attention to architectural details and classic style. We will finish the tour today by arriving back in Eugene.